Learn how to build a shuffleboard table on your own! Making a shuffleboard table can get you that much closer to playing shuffleboard at your house. The process of making a shuffleboard table can be detail-oriented, so you need to take your time when taking on such a project. It’s possible and Shuffleboard.net is going to show you how! 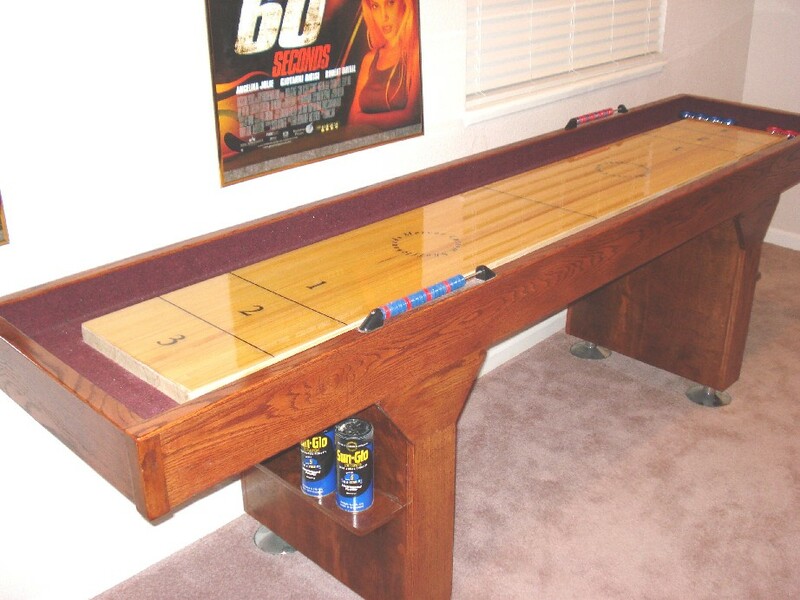 Before making a shuffleboard table you should find a room where you can put it and build it. Having adequate space and not being cramped is a great way to ensure you have a good time playing shuffleboard. If you are do it yourself kind of person and have the skills, you can make your own shuffleboard. 2. How much does it cost to build your own shuffleboard table? As you can imagine, the cost can vary vastly depending on the type and quality of materials that you use. Here are some figures to give you an idea of the cost to build your own table. 3. What tools do I need? Most of the tools needed include items that you would find in a typical woodworking shop. Table saw, miter saw, random orbital sander, surface planer, drill bit, router, biscuit joiner, clamps, saw horses, jig saw or bandsaw, carpenters square, leveler, sandpaper, and miscellaneous nuts and bolts. Building a shuffleboard table can be a hassle and hiring handyman to do it may be an option if you don’t find yourself savvy with working with wood. Still, you can give it a shot and hope for the best that you don’t mess it up. As far as parts go, the overall cost could land you over a thousand dollars for a decent shuffleboard table that will last and won’t look or perform unsatisfactorily. First, when assembling a shuffleboard table, you need to get the right supplies. MDF can be used when making a table as a cheaper alternative to the original kind of material which is pretty pricey. Joining the MDF to make the playing surface is important. After joining the MDF together, you should reinforce it to ensure it stays sealed. Ensuring that the bond stays will make for a sturdy table. When you look at professionally built shuffleboard tables like those made by Georgetown, Level Best, and McClure, solid wood is the way to go. Butcher block playing surfaces are thick and sturdy surfaces. Picking the right materials is key to having a table that will last long and wont’ move during instense playing sessions. Good types of wood include mahogany, oak, and maple. Always go with hardwoods whenever possible. MDF may look nice and cost less but hardwood is the best when you want to build a quality table. 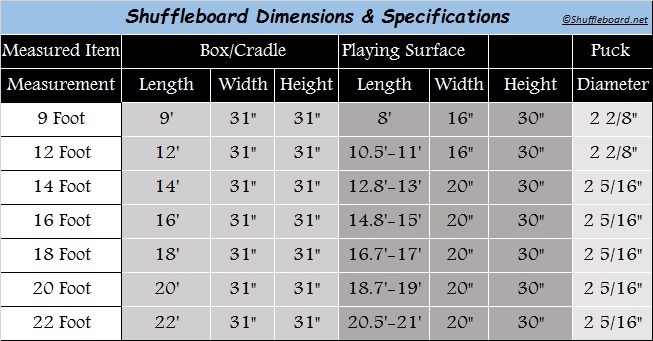 Below you will find a chart that details all of the dimensions you need to make different size shuffleboards from 9′ to 22′ official length tables. You can take a look at some of these tables to get an idea of how things are put together. Side View of a 17′ shuffleboard table. Overhead view of a shuffleboard showing leg spacing. Overhead view of playing surface dimensions on a 17′ table. Sealing the surface is the next step, you can seal it however you want to style it. After this, you should make the curling rings. This can be done with paper, measuring the diameters and tracing the curling rings. After making the surface, it’s time to make the box. You should put supports inside the box once assembled, and then lay in the OBF material inside the box. After that, you need to make sure the ends are even. If they are uneven, they should be fixed. Carpet is another important part of a good shuffleboard table. Using a staple gun, the carpet should be implemented to the box using staples. Additional support at this stage can be obtained by using bars that support the box itself. Adding these bars would be a fantastic investment and it would give you more support for your table overall. The last part of assembling the shuffleboard table would be the legs. The dimensions of the legs could be tricky depending on your box size and how tall or deep it is. Refer to the leg spacing diagram above for guidance. The measurements should be on point; otherwise the legs may not match the box which would result in faulty construction. Construction of the legs is a crucial part to ensuring that your box does not fall over or malfunction while you are playing. Wood is a common route of making legs to connect to the table. Dimensions should be checked to ensure that they will fit your box since every box is different and requires different components. By making the legs, you should then drill holes for the height adjusters/feet levelers and hammer in the height adjusters if needed. Once done with all of that, you can attach them to your table and you’re almost there. Scoring lines and finish can be applied once the table is assembled. You can paint/stain the outer trim before assembly if you prefer. After all the finishing touches are done, allow 48 hours for everything to dry. Climatic adjusters are essential to keeping your shuffleboard table aligned. Even if building your own, it’s a good idea to buy a set and install them. Otherwise your table will warp and have slopes that will affect play. You can learn more about climatic adjusters by reading this article. This is a great video from Jeff Fischer that shows you how to build your own table. It’s long (30 minutes) but there’s a lot of great information and details that you don’t want to overlook. If you want to save yourself from hassles, consider purchasing a shuffleboard from Shuffleboard.net. It comes with free shipping and no sales tax except CA. For some models, we can even put a logo of your choice to make it a custom table.